The work of 19th Century European painters includes some of the most enduring pieces of all time, and Impressionism, which originated during this period, remains one of the most popular and highly regarded art movements. With legendary names like Renoir, Pissarro, Manet, Morisot, Monet, Cezanne, van Gogh, Degas, Cassatt and others, it's easy to get lost in the wonderful works that came out of this artistic era. Our collection of antique art prints includes many of these highly prized 19th century European prints, as well as European etchings from the same period. You also have access to a large number of 19th century European lithograph works, including originals from Henri Le Sidaner and Pierre-Auguste Renoir. We proudly offer many rare and exquisite 19th Century European etchings, in addition to antique pochoirs and lithographs after famous paintings and watercolors. Medium: original etching and and aquatint with drypoint. Catalogue reference: Delteil 97. Executed in 1891, this lovely impression is from the edition on cream wove paper published in 1923 for inclusion in the Loys Delteil catalogue raisonne "Le peintre-graveur illustre: Pissarro, Sisley, Renoir (Volume 17). The plate size is 10 x 8 inches (255 x 201 mm); the full sheet measures 12 1/2 x 9 1/4 inches (318 x 235 mm). Not signed. 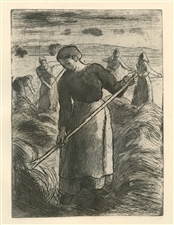 A great find and a magnificent print, showing Pissarro's skill as an etcher. Medium: original etching and drypoint. Executed in 1897, this impression is from the rare 1897 portfolio "Art et Nature" by Leon Roger-Miles, published in Paris by Boudet in an edition of 525. This is a rich, dark impression printed on Marais wove paper. The plate size is 8 x 6 inches (205 x 151 mm). This beautiful composition is one of several Pissarro paintings and etchings on a similar theme. Not signed. Condition: the publisher's original tissue guard is still intact and attached. There is foxing in the margins (see the second photo). Medium: original etching and drypoint. This rare and beautiful impression on japon paper is one of only 50 printed for the deluxe edition of the Gazette des Beaux Arts. Published in Paris in 1890, this Pissarro etching is printed in brown ink, rather than the typical black ink. Catalogue reference: Delteil 93. A fine impression with plate tone, measuring 7 3/4 x 5 1/4 inches -- 198 x 135mm (plate size) with full original margins. Not signed. Condition: there is some slight discoloration in the margin from having been previously framed. Paul Cezanne original etching "Guillaumin au Pendu"
Medium: original etching. Catalogue reference: Salomon 2. Executed in 1873, this is a portrait of the impressionist artist Armand Guillaumin. This is a fine impression with plate tone on cream laid paper from the rare 1906 first edition of "Histoire des Peintres Impressionnistes" by Theodore Duret, published in Paris by Floury. Plate size: 6 1/8 x 4 3/4 inches (155 x 120 mm); the total sheet size is 10 x 7 3/4 inches (260 x 193 mm). Signed in the plate with Cezanne's "hanging man" signature (not hand-signed). Condition: there is is minor foxing in the margins. Medium: original etching and drypoint with aquatint and roulette. This is an exquisite impression on japon paper, of what is arguably the most famous Felix Buhot etching. Executed in 1879 and published in Paris in 1881 for L'Art; the catalogue reference is Bourcard/Goodfriend 128. Image size: 9 1/2 x 13 3/4 inches (240 x 350mm). Signed in the plate with the Buhot monogram signature (not by hand). A good price for this impression on special paper, before letters and apart from the standard published edition. 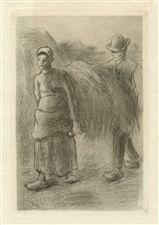 Jean-Francois Millet original etching "La Bouillie"
Medium: original etching. 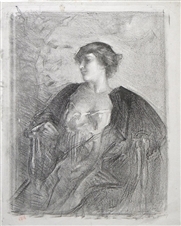 Executed by Millet in 1861, this impression on cream laid paper was published by the Gazette des Beaux-Arts in 1903. The plate size is 7 1/2 x 6 1/4 inches (187 x 160 mm). This is one of the best-known Millet etchings. Plate-signed, not hand-signed. 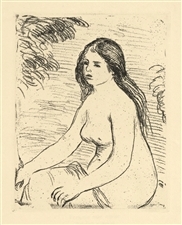 Berthe Morisot original drypoint "Jeune fille au repos"
Medium: original etching and drypoint. 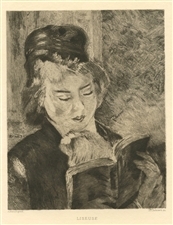 Executed in 1887, this impression on wove paper was published in 1910 for the rare first edition of "Manet & the French Impressionists" by Theodore Duret. This is a portrait of Julie Manet, who was the daughter of Berthe Morisot and Eugene Manet (the younger brother of Edouard Manet). Julie Manet was an artist herself, and as a girl she often posed for her mother, her uncle Edouard Manet and also for Renoir. The plate measures 3 1/8 x 4 5/8 inches; 78 x 119 mm. Not signed. There were a small number of impressions issued, after which the copper plate was cancelled with two punched holes. 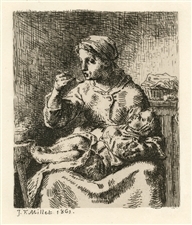 The etching offered here is from the first edition published after the plate was cancelled. This is a lucky find, and most collectors do not object to the holes, as they do indeed demonstrate the provenance of the piece. Medium: original etching and drypoint with aquatint and roulette. "L’Hiver a Paris" is also known as "La Neige a Paris". Executed in 1879 and published in Paris in 1881 for L'Art; the catalogue reference is Bourcard/Goodfriend 128. Image size: 9 1/2 x 13 3/4 inches (240 x 350mm). Signed in the plate with the Buhot monogram signature (not by hand). A fine impression on watermarked laid paper of this iconic Buhot etching. Medium: original etching and drypoint. Catalogue reference Delteil 126. Printed in 1900 and published in Paris by H. Floury as the frontispiece for Gustave Geffroy's "La Vie Artistique". Printed on laid paper, the plate size is 4 3/4 x 3 1/4 inches (120 x 80 mm). Not signed. Condition: there are a few spots of foxing and areas of age-toning to the paper. Jean-Baptiste-Camille Corot original etching "Souvenir de Toscane"
Medium: original etching. Catalogue reference Delteil 1. This impression on cream laid paper was published by the Gazette des Beaux-Arts in 1903. Plate size: 4 7/8 x 7 inches (125 x 180 mm). Not signed. Anders Zorn original etching "Self Portrait with Inscription"
Medium: original etching. Catalogue reference: Asplund 185. This is a good impression with plate tone, on watermarked laid paper from the edition of only 200 printed in 1905 for Schubert-Soldern's ”Das radierte Werk des Anders Zorn”. The etched inscription beneath the portrait reads “Gärdi onums weiser wen an wilda” (His works show his will). Plate size: 6 1/4 x 4 3/4 inches (157 x 121 mm); the total sheet measures 9 3/4 x 5 1/8 inches (245 x 130 mm). Signed by Anders Zorn in the plate (not by hand). Condition: the margins are narrow on the right and left sides. Rare. Anders Zorn original etching "Village Violinist"
Medium: original etching. Catalogue reference: Asplund 186. A very nice impression on laid paper, printed in Paris in 1907 for Gazette des Beaux-Arts. Plate size: 6 1/4 x 4 3/4 inches (160 x 120 mm). Signed by Zorn in the plate (not by hand). Medium: original etching and drypoint. This impression on laid paper was printed in 1893 for Gustave Geffroy's "La Vie Artistique". Catalogue reference: Delteil 11. Plate size: 6 x 3 3/4 inches (148 x 95 mm). Signed in the plate (not by hand). 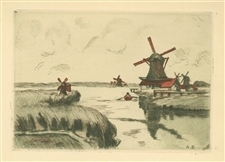 Medium: lithograph (in smaller size after the original lithograph). This edition was published in Germany by Cassirer ca. 1903, and is now rare. Printed on smooth cream wove paper. Image size: 5 3/4 x 5 inches (150 x 120mm); the sheet size is 10 1/4 x 7 1/4 inches (280 x 225mm). Not signed. Medium: original etching. Catalogue reference Guerin 21. In 1880 Forain executed six etchings for J. K. Huysmans "Croquis Parisiens"; only four were published at the time. 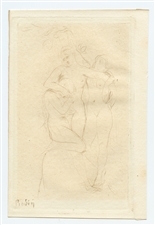 This etching is one of the two "refusées" (refused by publisher Henri Vaton, presumably for being too risque. The scene depicts life in a Paris brothel.). A fine impression on laid paper. Not signed. Plate size: 3 3/4 x 5 3/4 inches (97 x 147mm). This impression is one of the rare few to have been printed in 1880; a small later edition was also printed. Charles Meryon etching "Passerelle du Pont au Change"
Medium: original etching. The complete title is "Passerelle du Pont au Change apres l'incendie de 1621". Catalogue reference: Delteil/Wright 50. This is a view of the footbridge which temporarily replaced the Exchange Bridge in Paris after the disastrous 1621 fire. This impression on chine-collé paper was printed in Paris by Delatre and published in 1860 by Gazette des Beaux-Arts. Image size: 3 3/4 x 7 7/8 inches (95 x 200mm). Signed in the plate (not by hand). This is a good impression of this well-known Meryon etching in fine condition. Medium: etching with drypoint and roulette. Catalogue reference Bourcard/Goodfriend 123. This impression on cream laid paper is from the edition for "French Etchers", published in New York in 1884. Plate size: 9 1/4 x 12 1/4 inches (235 x 310 mm). Signed in the plate (not by hand). Condition: there is minor foxing to the margin. Charles Meryon original etching "Bain-Froid Chevrier"
Medium: original etching. The catalogue reference is Delteil 44. Executed in 1864 and printed on wove paper by Pierron Montfaucon. Plate size: 5 1/8 x 5 3/4 inches (130 x 145mm). This is one of the Charles Meryon etchings featuring scenes of the old section of Paris, for which the artist is famous. Signed with Meryon's monogram in the plate (not by hand). Condition: there is a bit of discoloration in the margin, not affecting the image. Jean-Baptiste Corot / Walter Sickert etching "The Boatman"
Medium: etching and aquatint. 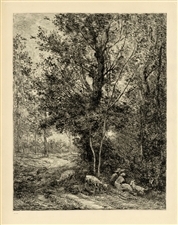 Etched by Walter Sickert after Corot and published in 1890 in an edition of 200. This is a nice impression printed on a japon-style paper. The image measures 4 3/4 x 6 5/8 inches (122 x 168 mm). Signed in the plate by Corot and Sickert (not by hand). Some believe that Walter Sickert may have been Jack the Ripper, although this theory does not seem to be widely held. Sickert was a close friend of artist James Abbott McNeill Whistler, until the two had a falling out.